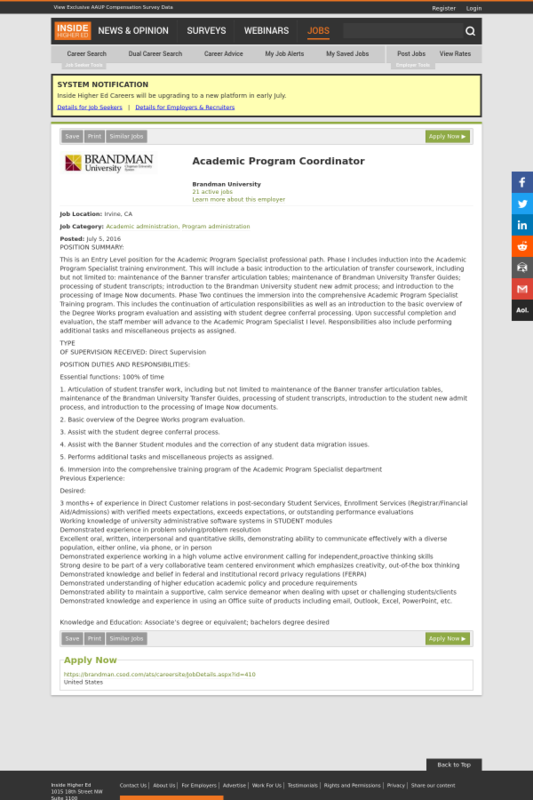 This is an Entry Level position for the Academic Program Specialist professional path. Phase I includes induction into the Academic Program Specialist training environment. This will include a basic introduction to the articulation of transfer coursework, including but not limited to: maintenance of the Banner transfer articulation tables; maintenance of Brandman University Transfer Guides; processing of student transcripts; introduction to the Brandman University student new admit process; and introduction to the processing of Image Now documents. Phase Two continues the immersion into the comprehensive Academic Program Specialist Training program. This includes the continuation of articulation responsibilities as well as an introduction to the basic overview of the Degree Works program evaluation and assisting with student degree conferral processing. Upon successful completion and evaluation, the staff member will advance to the Academic Program Specialist I level. Responsibilities also include performing additional tasks and miscellaneous projects as assigned. 1. Articulation of student transfer work, including but not limited to maintenance of the Banner transfer articulation tables, maintenance of the Brandman University Transfer Guides, processing of student transcripts, introduction to the student new admit process, and introduction to the processing of Image Now documents. 2. Basic overview of the Degree Works program evaluation. 3. Assist with the student degree conferral process. 4. Assist with the Banner Student modules and the correction of any student data migration issues. 5. Performs additional tasks and miscellaneous projects as assigned. Demonstrated knowledge and experience in using an Office suite of products including email, Outlook, Excel, PowerPoint, etc.